You’ll be looking for the 40 items listed on the top cap plus a mystery object disclosed in the playing cards. Every object has an assigned value, from one to 20. Spotting Bigfoot earns one point, the mystery object eight, and the often elusive penny inside every Find It tops all the others at 20. With multiple ways to play, the Find It Mythical Creatures toy challenges your knowledge of folk tales and supernatural beings from around the world. Keep a dictionary or Wikipedia handy while going down the list. Otherwise, when you see the word hippocampus, you might think of the region of our brain thought responsible for emotions and memory, and although that’s true, you’d be missing a chance to identify one of the fish-tailed horses of Greek Mythology. The beauty of Find It Mythical Creatures is the chance to find out who’s who and what’s what, then check each off the list. While concentrating on finding out about the Jersey Devil, a kraken, or a troll or taking note of the similarities and differences between a hippocampus and a manticore, you’ll feel more relaxed. Play is the ultimate distraction, the perfect antidote to stress, and the best way to learn. Remember how impressed adults are by preschoolers who can identify and pronounce the names of dinosaurs? Mythical Creatures entices players to learn more about these rich traditional stories and create their own tales. Find It makes an ideal gift for a child or adolescent in hospital by providing distraction and inviting social interaction. With themes ranging from Kids World and Eww Gross to Where’s Waldo and At the Beach, there’s something to excite everyone. Altogether you’ll be looking for the 40 items listed on the top cap plus a mystery object divulged in the playing cards. Every item has an assigned value, from one to 20. Stinky shoes earn one point; the mystery object brings in eight. The often elusive penny inside every Find It tops all other items at 20. With multiple ways to play, Eww Gross could spawn a Gross-a-thon with the winner being named Chief of Gross. Eww Gross provides hours of “purposeful play” as players search out revolting finds. Find It games are versatile “contained adventures” for one or more players who can decide to suspend play, then resume as time, opportunity, and interest permit. Players keep track of the finds and pick up where they left off when play resumes. This encourages spontaneous play, both alone and with others. Adults and children can play together, taking turns or joining forces, and will delight in the experience as found objects trigger laughter, memories, and storytelling. This is the Find It for those, typically early elementary school-aged boys, who delight in barf, boogers, and pee. Find It both requires and improves concentration and focus. Focusing on the search for objects relieves stress by distracting players from whatever else might be going on. Keeping a favorite Find It handy can prove indispensable in preventing meltdowns and in rebuilding afterwards. Find It also makes an ideal gift for a child or adolescent in hospital by providing distraction and inviting social interaction. With themes ranging from Mythical Creatures and Dinosaurs to Kids World and Eww Gross, there’s something to entice everyone. All objects are listed on the top cap and the enclosed Ways to Play guide lists an assigned value for each item. The easiest to find earn one point while the elusive penny earns 20. Double-sided playing cards provide additional games for two or more players. 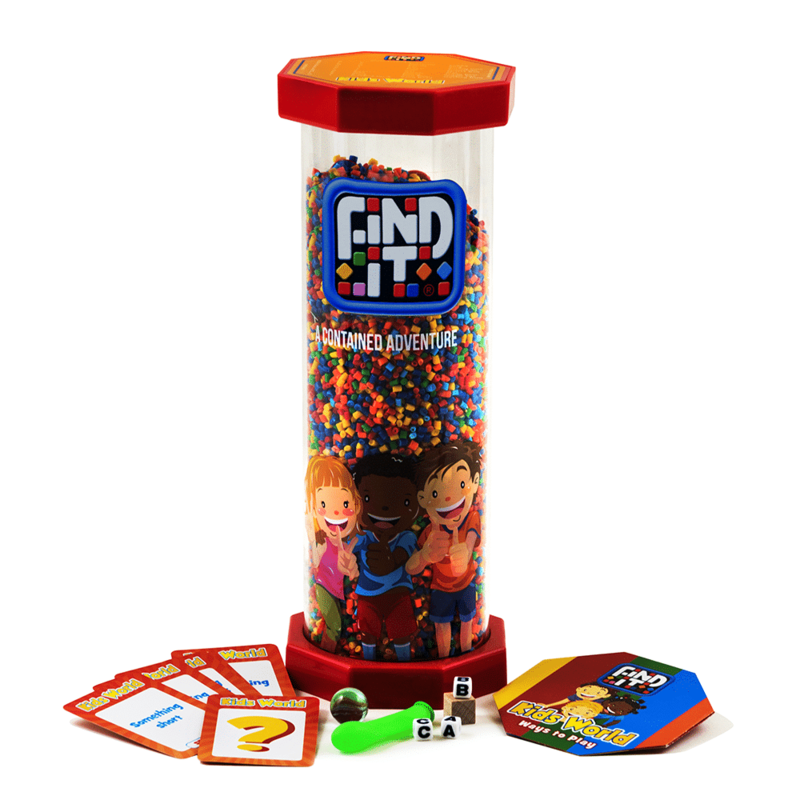 Find It Kids World provides hours of “purposeful play” as players search for letters and objects. Find It games are versatile “contained adventures” for one or more players who can decide to suspend play, then resume as time, opportunity, and interest permit. Players keep track of their finds and pick up where they left off when play resumes. This encourages spontaneous play, both alone and with others. Adults and children can play together, either working together to find all the objects or in friendly competition. Find It both requires and improves concentration and focus. Focusing on the search for objects relieves stress by distracting players from whatever else might be going on. Keeping a favorite Find It handy can prove indispensable in preventing meltdowns and in rebuilding afterwards. Find It also makes an ideal gift for a child or adolescent in hospital by providing distraction and inviting social interaction. With themes ranging from Mythical Creatures to Dinosaurs and Wildlife, there’s something to excite everyone. The 40 everyday objects are printed on the top cap, and an insert assigns a value to each hidden object. The easiest to find ones each earn one point while finding the elusive penny earns 20. Two-sided playing cards pose challenges for multiple players in search of hidden treasures. 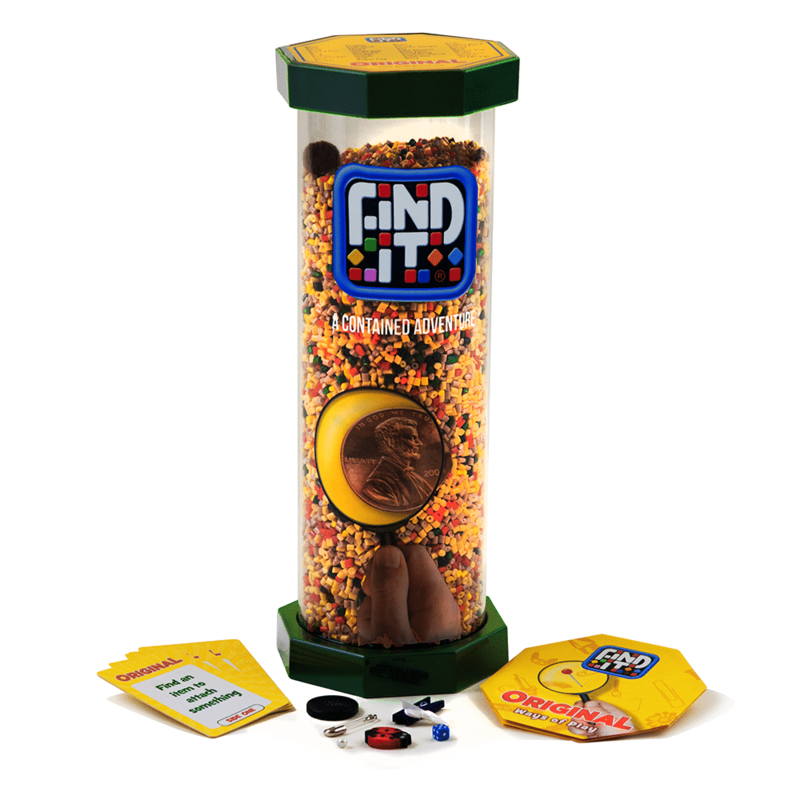 The Find It Original game provides hours of “purposeful play” as players search for common objects. Find It games are versatile “contained adventures” for one or more players who can decide to suspend play, then resume as time, opportunity, and interest permit. Players keep track of their finds and pick up where they left off when play resumes. This encourages spontaneous play, both alone and with others. Adults and children can play together, either working together to find all the objects or in friendly competition. 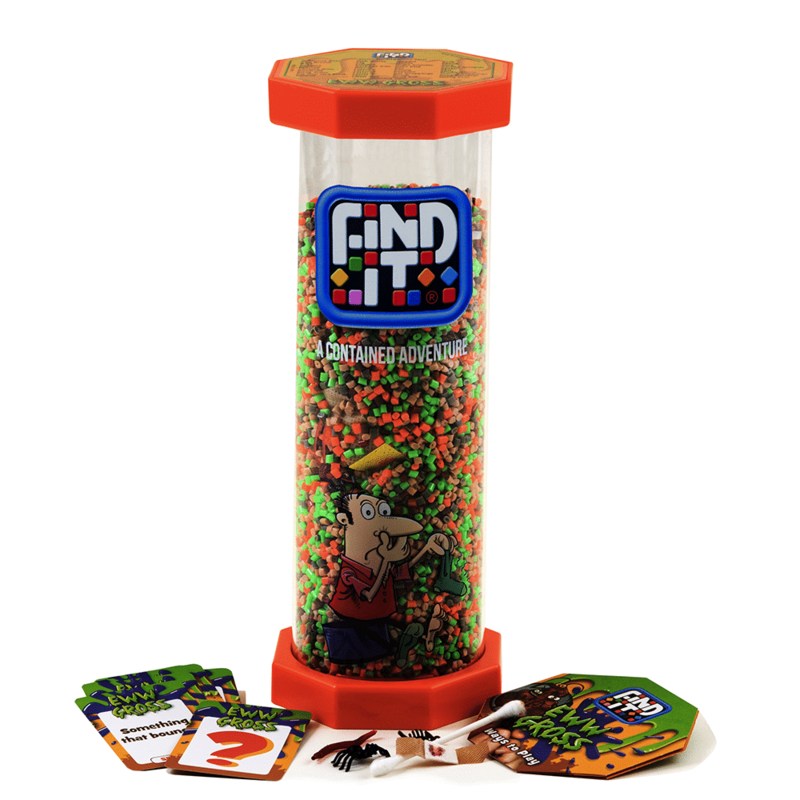 The Find It Original game both requires and improves concentration and focus. Focusing on the search for objects relieves stress by distracting players from whatever else might be going on. Keeping a favorite Find It handy can prove indispensable at dispelling tension, preventing meltdowns, and rebuilding afterwards. Find It also makes an ideal gift for a child or adolescent in hospital by providing distraction and inviting social interaction. With themes ranging from Mythical Creatures and Dinosaurs to Where’s Waldo? and At the Beach, there’s a Find It for every age and interest. 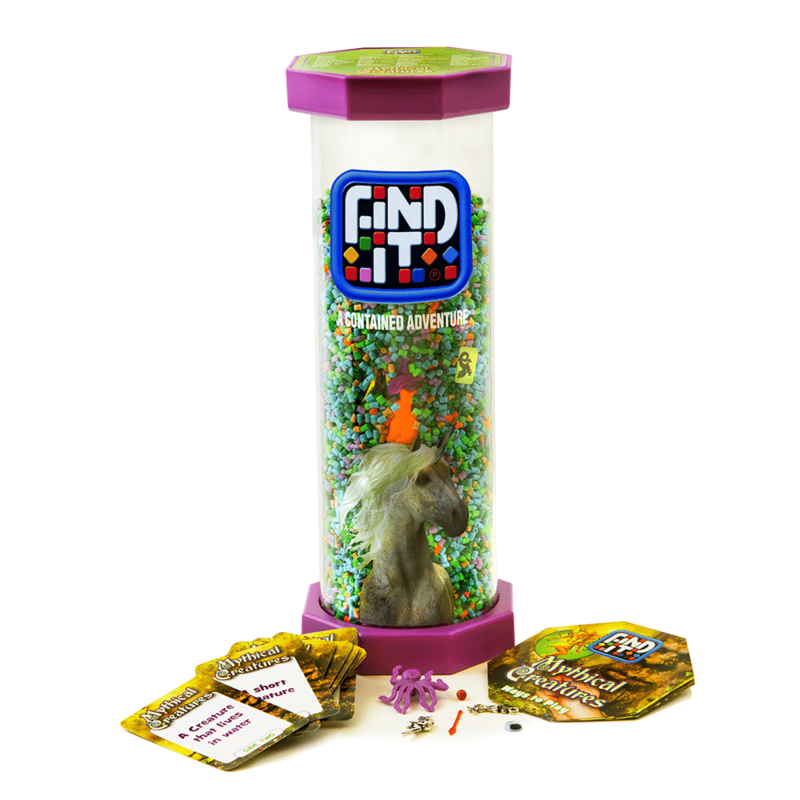 Discover the Identity Games Find It Mythical Creatures Toy! With 40 likely found in the wild objects, Find It WildLife makes planning an excursion to the zoo more fun. All objects are listed on the top cap and the enclosed Ways to Play guide lists an assigned value for each item. The easiest to find earn one point while the elusive penny earns 20. Double-sided playing cards provide additional games for two or more players. For those who have been to the zoo, some of the hidden objects will be familiar, likely others previously unknown. Here’s a chance to find members of the animal kingdom you’re likely to spot in your own yard and others you hope you never do. 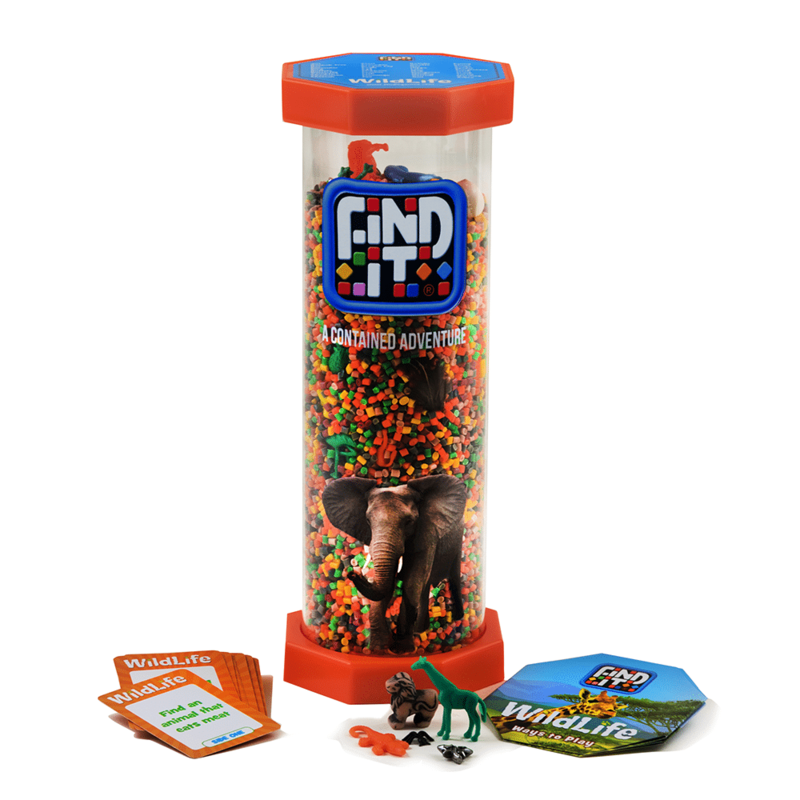 Find It Wildlife provides hours of “purposeful play” as players search objects you’d likely encounter in the wild. Find It games are versatile “contained adventures” for one or more players who can decide to suspend play, then resume as time, opportunity, and interest permit. Players keep track of their finds and pick up where they left off when play resumes. This encourages spontaneous play, both alone and with others. Adults and children can play together, either working together to find all the objects or in friendly competition. Find It both requires and improves concentration and focus. Focusing on the search for objects relieves stress by distracting players from whatever else might be going on. Keeping a favorite Find It handy can prove indispensable for preventing meltdowns and rebuilding after one. Find It also makes an ideal gift for a child or adolescent in hospital by providing distraction and inviting social interaction. With themes ranging from Kids World and Eww Gross to Mythical Creatures and Dinosaurs, there’s something to excite everyone. With 40 beach related objects, Find It At the Beach makes any drive to the coast more enjoyable. All objects are listed on the top cap and the enclosed Ways to Play guide lists an assigned value for each item. The easiest to find earn one point while the elusive penny earns 20. Double-sided playing cards provide additional games for two or more players. For those who have been to the beach, some of the hidden objects will be unfamiliar, perhaps even unknown. That’s a teachable moment, a chance to talk about how beaches and the creatures that inhabit adjacent oceans vary by location. 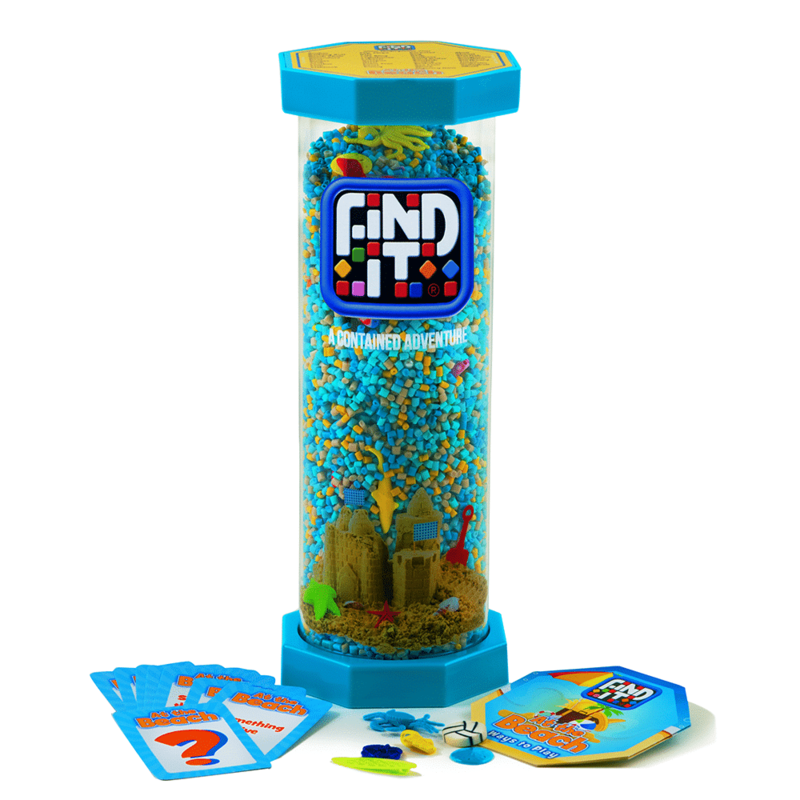 Find It Kids provides hours of “purposeful play” as players search for beach related objects. Find It games are versatile “contained adventures” for one or more players who can decide to suspend play, then resume as time, opportunity, and interest permit. Players keep track of their finds and pick up where they left off when play resumes. This encourages spontaneous play, both alone and with others. Adults and children can play together, either working together to find all the objects or in friendly competition. Find It both requires and improves concentration and focus. Focusing on the search for objects relieves stress by distracting players from whatever else might be going on. Keeping a favorite Find It handy can prove indispensable in preventing meltdowns and in rebuilding afterwards. Find It also makes an ideal gift for a child or adolescent in hospital by providing distraction and inviting social interaction. With themes ranging from Mythical Creatures and Dinosaurs to Kids World and Eww Gross, there’s something to excite everyone. With 40 objects likely found at an archaeological dig, Find It Dinosaurs makes planning a trip to a natural history museum more fun. All objects are listed on the top cap and the enclosed Ways to Play guide lists an assigned value for each item. The easiest to find earn one point while the elusive penny earns 20. Double-sided playing cards provide additional games for two or more players. For those knowledgeable about prehistoric animals, some of the hidden objects will be familiar, others likely not. Here’s a chance to impress those who don’t know a brachiosaurus from a barnacle with your knowledge. 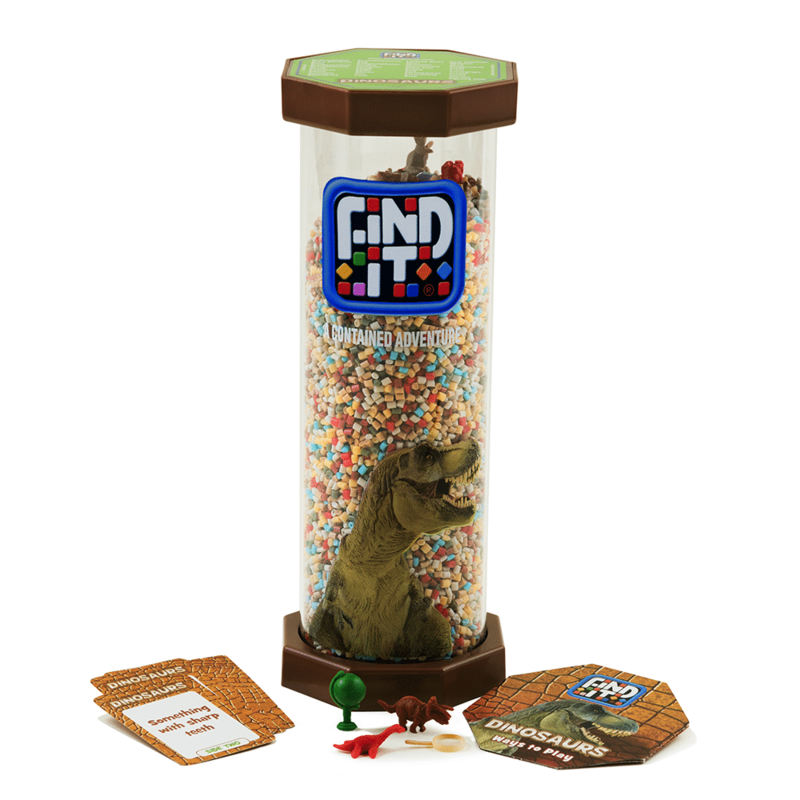 Find It Dinosaurs provides hours of “purposeful play” as players search for objects you’d likely encounter at a dinosaur dig. Find It games are versatile “contained adventures” for one or more players who can decide to suspend play, then resume as time, opportunity, and interest permit. Players keep track of their finds and pick up where they left off when play resumes. This encourages spontaneous play, both alone and with others. Adults and children can play together, either working together to find all the objects or in friendly competition. Now is the time to explore ways for everyone to enjoy spending time together while schools are closed for the holidays. Fewer hours of daylight and dropping temperatures force us indoors where we’re all too likely to retreat into the digital world. Engaging in a shared activity hones our social skills, enhances our sense of connectedness, and builds memories. What can be challenging is finding something that children and adults enjoy doing together. Cooking and crafts are easily adaptable so that all ages can participate together. Putting together puzzles and playing a board game are other options. Cooperative games level the playing field as everyone works together to achieve a common goal. From preschoolers to centenarians, all players “put their heads together” to solve a problem and come away with positive feelings. 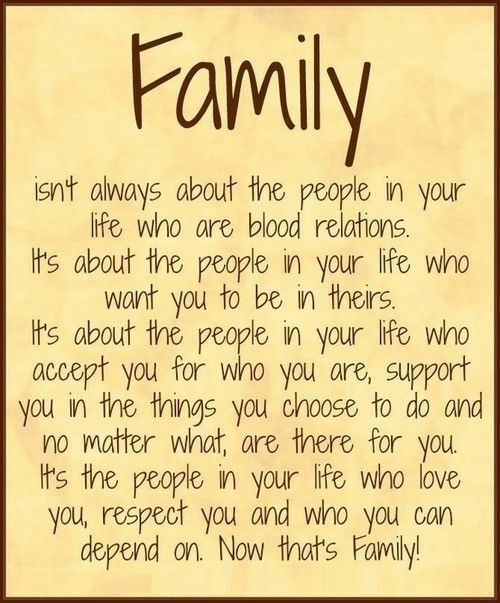 Everyone wins. No one leaves the game gloating or sulking, negative feelings that would surely cast a dark cloud over winners, losers, and everyone else in the house. PlayopolisToys sells cooperative board games from Peaceable Kingdom, each focusing on developing specific skills and designed to teach social skills – from following directions, to taking turns, and cooperating. Snug as a Bug in a Rug, with its three levels of play, develops visual discrimination, matching, language, cognitive, and fine motor skills. With Stack-Up players aim to stack 12 blocks before the Stack Smasher topples the tower. Stacking is easy compared to what happens when a player spins a Challenge that adds a tricky task to stacking! He could be instructed to stack with one eye closed or while singing. Stack-Up develops eye-hand coordination and balance. Players practice color recognition and counting as well. Cooperative board games are an ideal alternative to digital devices. Social engagement and sharing a pleasurable, interactive activity benefit everyone, young and old alike. What better time than the holidays to make memories by playing games?